Las Vegas police say a man is under arrest after a chase involving police ended in a crash this morning. Police believe the man and woman may be responsible for several robberies in Las Vegas and North Las Vegas. 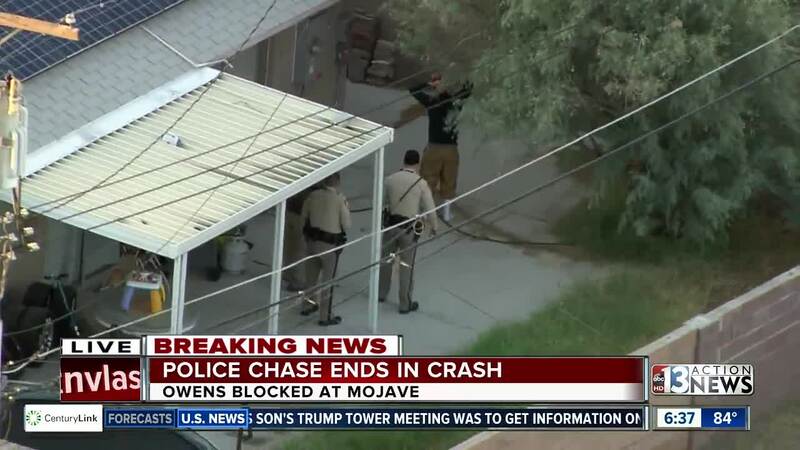 Las Vegas police say three people were arrested Tuesday morning after a chase ended near Owens Avenue and Mojave. The suspects are believed to be responsible for at least 9 robberies in Las Vegas and North Las Vegas. Initially it was reported that one man was arrested and a woman was transported to a local hospital with injuries after the crash which also believed a police officer. Las Vegas police later told the media that 3 people total were arrested and they are still looking for 3 more people.